Being at the height of January belt-tightening, many still carry the regrets for the Christmas excess. So putting both things together, we have the perfect opportunity to get to the food market and enjoy the beauty and taste of winter vegetables. Last Saturday, a windy and somehow unpleasant day, I visited the Guadalorce Organic Market in Malaga, organic food producers and farmers putting all their efforts in changing our consumption habits, producing close, healthy and quality food. I went straight to Jose Mª Florido stall. He is passionate about his relationship with the country and the healthy food he produces, but also about transmitting his passion to any client stopping at the market stall or any person reading his blog, Bobalén Ecologico. A disguised poet, he stands up for simple life wonders, respect for nature and closeness to the roots, and loves being a farmer, hard as it is. And the most important thing, he wants to share all his enthusiasm and knowledge with us. 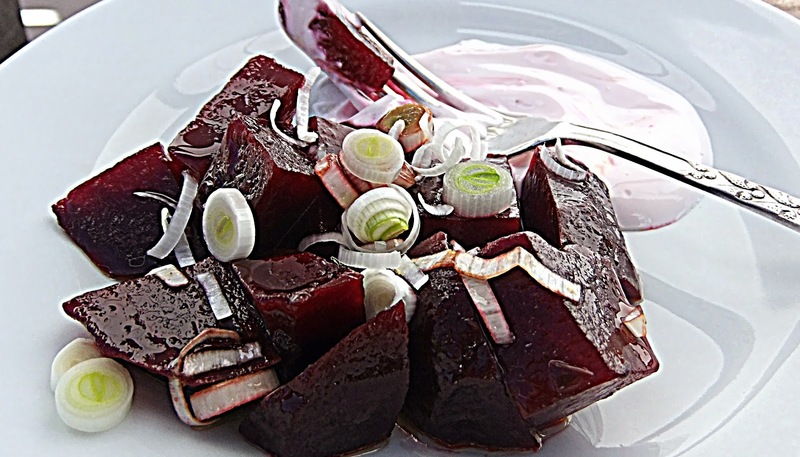 Ingredients for 2 people: 2 medium boiled beets cut in thick dices, 1 smashed garlic clove, 1 spring onion chopped. For the dressing: 3 tbsp. extra virgin olive oil, 1 tbsp red wine vinegar, salt and freshly ground pepper to taste. The best thing is buying fresh beets, organic if possible, though they can be found already cooked in amost every supermarket. To cook them: clean them carefully without damaging the skin and leave about one inch of the stem connected to the whole root (don’t discard the stems and leaves, they are delicious). Steam or boil the beets covered with water until tender when poking them with a stick. Let them cool and peel. To prepare the dressing, put all the ingredients along with the garlic and spring onion in a container with a lid, close and shake until well mixed. Place the beet dices on a bowl and pour the dressing over it. Cover and refrigerate for at least one hour. Mix the salad before serving. Sooo good! A final tip: Serve this salad with a thick and creamy yogurt, like they do in many Arabic countries. You may dye it with the beet for a pink touch!